WOMADelaide today announced the full program for its 2019 Planet Talks Program, hosting some of the world’s foremost thinkers, activists, scientists and leaders in engaging and inspiring thought provoking conversations. Marking International Women’s Day on the Friday evening of WOMADelaide, Natasha Stott Despoja AM will deliver the International Woman’s Day address, followed by an in conversation between Natasha and journalist, politics commentator and media identity, Annabel Crabb. On the Saturday of the festival the WOMADelaide Planet Talks open with two key Radio National identities in Fran Kelly and Patricia Karvelas, bringing to life one of Australia’s favourite Political Podcasts, The Party Room. Leaving the comforts of the studio for the surrounds of the festival for the first time, join two of Australia’s most renowned broadcasters and some special guests as they analyse the latest political issues from Canberra affecting our world. Saturday also includes pioneering scientists Brian Pickles and Monica Gagliano and Nature Connection guide Alex Gaut, who will explore the fascinating hidden world of tree communication, plant cognition and the healing powers of forest bathing. Gagliano’s research has uncovered ‘thinking plants’ while Pickles’ work surrounding mycelium communication networks, dubbed the ‘Wood Wide Web’, has exposed a world where plants and trees share, trade, care for family, display altruism and even wage war. Sunday includes a discussion on the magic of mushrooms with Gavin McIntyre from groundbreaking biofabrication New York company Ecovative Design, mycologists Brian Pickles and Alison Pouliot and mycotecture designer Mike Hornblow. Fungi have preceded trees and animals on the Earth by hundreds of millions of years and they’ll be cleaning humanity’s mess long after we’re gone. But can the humble shroom help us save the planet right now? 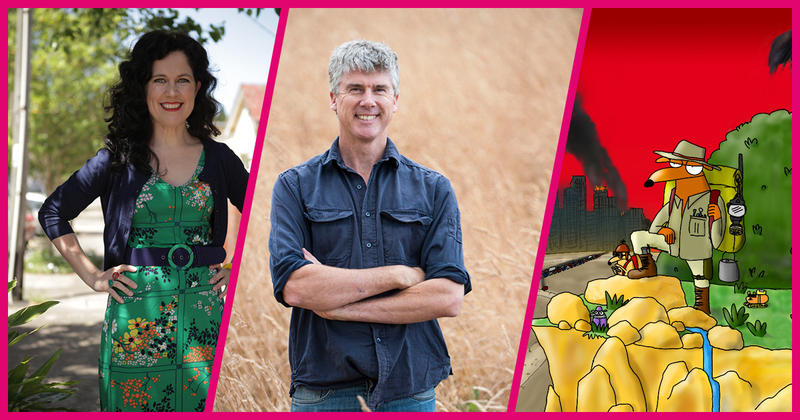 Walkley award-winning editorial cartoonist for The Guardian, National Treasure and bestselling author First Dog on the Moon has written and/or illustrated numerous books including the recent First Dog’s Guide to Surviving the Impending Apocalypse. First Dog On The Moon has come to the rescue with a crash course in surviving the Armageddon and just as importantly, how to stay nice doing it. “The growing appeal and appetite of festival audiences for the discussion forum provided by the Planet Talks, has led us to move the program from Speakers’ Corner into a new purpose built venue - the “Frome Park Pavilion”, which will comfortably seat up to 500 patrons for each of these fascinating discussions and conversations” said WOMADelaide Director Ian Scobie. On The Monday of the festival the WOMADelaide Planet Talks will explore if we can really tackle climate change without addressing our relationship with meat consumption and the livestock industry? Join Less Meat Less Heat CEO Angie Plummer, CSIRO Food Systems scientist, Cecile Godde and farmer / SBS TV food documentary maker, Matthew Evans for a discussion on what needs to be done and where to start. Our Prime Minister recently declared the need for “fair dinkum power" when the wind isn't blowing and the sun isn't shining. Join Prof Quentin Beresford, author of “Adani and the War on Coal”, and Greenpeace CEO and author of “The Coal Truth” David Ritter, as they discuss the Adani saga and the power behind the Commonwealth Government’s passion for coal over a 100% renewable energy future. In the final 2019 WOMADelaide Planet Talks session, The Wilderness Society’s Peter Owen, Mirning Elder and Coloured Stone frontman Bunna Lawrie and marine scientist Jodie Rummer, represent a large and growing movement of concerned people, councils, businesses, industries, environmental and scientific organisations opposing the proposed oil drilling by Norwegian oil company Equinor. On one side supporters of the drilling point to jobs and economic benefits for the state while the others highlights oil spill modelling presenting catastrophic consequences for fisheries and tourism industries worth over $1.5 billion collectively per annum in one of the most pristine ocean environments left on Earth - The Great Australian Bight.